On Saturday the 5th of May, the Warwick Knights mixed Touch Rugby team competed in the first round of England Touch’s National DTS Series. The team, Coached by Jack Linstead and Adam Rushforth, were led out onto the field by Captain Adam Evans who inspired the team to 1st place in their group at the end of the pool stages. The First game saw The Knights tap-off against Guildford’s ‘G-Force’ . Warwick dominated the opening five minutes, maintaining possession within their opponents 5 metres. After two un-successful dives for the line by Michelle Matthews and Dan Harris, G-Force broke Warwick’s defensive line and sprinted away as if to score the first try of the game, but came up 5 metres short. After placing the ball short of the try line twice, G Force were on the defence but with only a few minutes left of the first half, Evans broke through the defence to put Warwick up 1 – 0. The score was then equalled with a long run from the Guildford side. With only a minute to go before half time, Ben Edwards hit a gap whilst making his way on to the field from the sub-box and put the score at 2-1 to Warwick going into half time. The second half saw another try from G-Force, and the winning score was made by Evans hitting a gap from the 10 Metres. This Left the Final Score Warwick 3 – 2 G- Force. The second game saw Warwick placed against a competitive Horsham Tigers. Warwick was off to a hopeful start with a strong defence forcing Horsham to give up their attacking sets. A low dive from Harris was disallowed as a touch was made whilst in motion. Fresh legs were brought on in the form of Claire Davis, Dominic Bes-Jeary, Marie Murphy and Evans, who managed to time his entrance to the field perfectly to make his way past the defence. This brought the score 1-0 to Warwick. In the 2nd half, the opposition played an aggressive restart and were able to take the lead just a matter of seconds after the tap off. The score at full time was Warwick 1 – 5 Horsham. The final pool game saw a Midlands derby against the Northampton COYS. Being equally matched, with Warwick narrowly taking the victory at their last encounter, both teams went in to half time scoreless. Marnie Owen was able to put the first points on the board for Warwick with a perfectly timed switch, hitting the hole skilfully set up by Evans. With a few minutes to go until full time, new team member Chris Wood scored his first DTS try, and rounded off the final score with Warwick 2 – 0 Northampton thanks to the strong defence of Richard Biddle in the Mids and Teresa Labatzki on the wing. At the end of the pool stages, with Warwick winning their group, the Knights were placed 5th going into the Knockout Stages. The first game of the afternoon saw Warwick play the 4th placed Yorkshire Thorns in the Cup Quarter Final, but were knocked down into the Plate Semi Final despite the best efforts of Rushforth and Evans whose Tries put the final score at Warwick 2 – 4 Yorkshire. 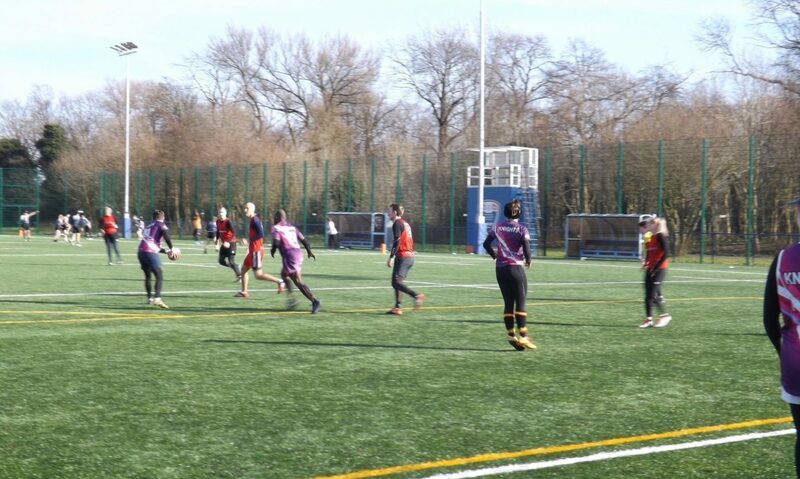 This moved Warwick down into the Plate Semi-final against Manchester Chargers, who had been placed 1st at the end of the group stages. Unfortunately this game brought the day to an end despite the 3 Warwick tries made by Evans, Edwards and Owen. With the Final Score at Warwick 3 – 5 Manchester. This result put Warwick in 7th Place overall in the National DTS League Table. Warwick Touch is a mixed Touch Rugby team, and takes players of all ages (14+), abilities and fitness levels. They train Mondays 18:00 – 19:30 at old Leamingtonians, and Saturdays 10:00 – 12:00 at St Nicholas Park in Warwick. Contact warwicktouch@hotmail.com for more details. New players always welcome. Warwick Touch is a touch rugby club operating sessions on a Monday evening from 6pm to 7.30pm at Old Leamingtonians Rugby Club in Leamington, and at St Nicholas Park in Warwick on a Saturday morning from 10am until midday. We play social touch, and regularly enter national competitions, making our club a great base for all levels, from complete beginners through to those looking to play at a regional and national level.